The New Kingdom of Egypt marks the apogee of military organisation and preparedness. Beginning the era under foreign occupation, the Egyptians built up an army to challenge the invaders and liberate their land. Using the newest battlefield technologies (bows, chariots and hand weapons) the new pharaohs pushed the frontiers of the New Kingdom into Syria and Ethiopia. This is the era of Set I, Ramses II and Thuthmoses III, the greatest military pharaohs in Egyptian history. This book narrates this incredible rise to power and then describes in detail the way in which the Egyptian war machine was structured, how it was supplied, and how it fought. It considers all aspects, some often neglected, such as campaign tents, logistics and rations, as well as the design of hand weapons and bows. Many pieces of kit have been reconstructed for the book, giving the reader a very immediate sense of what an Egyptian warrior's equipment looked like. Walk the Wall, gaze northwards across hostile territory, man the turrets and milecastles...What was life like for the Roman troops stationed on Hadrian's Wall? Follow the life of one man, a Tungrian soldier, through recruitment, training, garrison duty and war. Focussing on a single point in time and one fort on the Wall, we explore every aspect of military life on this bleak and remote frontier. Where was he born? What did he spend his money on? How did he fight? What did he eat? Did he have lice or fleas? Archaeology and the accounts of ancient writers come together to paint a vivid picture of a soldier on the Wall soon after its completion in AD 130. Historical reconstruction and experimentation fill in the gaps that are left. Step back into the past, step into the marching boots of Tungrian soldiers as they patrol Rome's greatest frontier. From spit roasting pig to hanging cream cheese from the rafters, from baking roast pork under the ground in pits to cooking trout on wicker frames over an open fire, cooking techniques in prehistoric Britain are ingenious and revealing. In reconstructing some of these techniques and recipes, the author has discovered a different world, with a completely different approach to food. 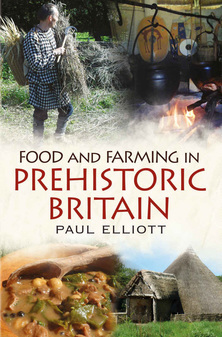 This book first tells the story of prehistoric settlement, and moves on to explore the hunting and foraging techniques of the Mesolithic. After discussing the way in which the Britons farmed, and what they grew, the book moves into the roundhouse and the tools and utensils available. The final half of the book examines the varied techniques used, from covering fish in clay, to baking meat underground, spit roasting, brewing mead, boiling water with hot stones and so on. The Roman emperor Julian leads a huge army into Iraq – home to the unassailable Persians. Only a tiny fraction of the army will ever reach home again … Caught up in this awful disaster is Dionysus, a new recruit to the legions, who by degrees is drawn into a plot against the emperor Julian. The book swoops right in to the ground level bringing to the reader the heat and dust, the blood and flies of the desert war. With it too comes the burning fear of death and of discovery. On the march and in the battles his mind is torn by his love for a girl left behind at his last billet, and his hatred for a squad member who brags of taking his girl by force before they left for war. Dionysus’ longing for home and hatred for the emperor who he blames for the war, fuel his determination to win out against the odds. Written in the first person, this gritty drama has the feel of a soldier's war diary; the terror, hardship and desperation mirror the experiences of British soldiers fighting in South Africa, or Wermacht fleeing from the Soviet counter-attack on the Eastern Front. The third century AD was a turbulent and testing time for the Roman Empire. The army had real political power in the third century, making and unmaking emperors as it saw fit. While the army gained rapidly in size, stature and political savvy during the reign of Septimius Severus, it also accelerated a material transformation. Armour, shields, helmets, swords and javelins all began to be replaced with new styles. Legions in Crisis looks closely at the new styles of arms and armour, comparing their construction, use and effectiveness to the more familiar types of Roman kit used by soldiers fighting the earlier Dacian and Marcomannic Wars. What did this transformation in military technology mean for the tactical choices used on the battlefield? Although the outcome had looked in doubt, the army and the empire it protected weathered the storm to emerge into the fourth century fully able to tackle the challenges of a new age. In AD 400 Roman rule in Britain was collapsing as the thinly stretched empire was besieged on all sides. In "The Last Legionary", Paul Elliot explores all aspects of Late Roman military life, from recruitment to weaponry, marriage to wages, warfare to religion. It explores the world of the Roman soldier through the eyes of one man, posted to a British garrison at the edge of the empire, and follows the soldier's life through training and battle, marriage and business dealings, finally following him south as he leaves Britain for good in defence of Rome. When the legionary finally escapes the worst posting in the Roman Empire, it is only to join what effectively became a death march over the Alps, without food or shelter. To know what is was like to face the chanted battle cry, the charge and slashing axes of the Goths, and to understand why the order 'March out!' was so terrifying, read Paul Elliott's mesmerising, meticulously accurate account. I have written several articles for Ancient Warfare magazine. The books I wrote in the 1990s are no longer in print but they are still often available on Amazon through second-hand sales.